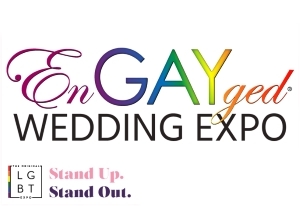 Stephanie + Bianca - 2015 EnGAYged Wedding EXPO Giveaway Finalists! Hello my name is Stephanie and my fiancé is Bianca she's the love of MY life! We met 8 years ago in high school and from the first moment I met her I knew she had to be in my life BUT Bianca was too scared to talk to me because she didn't know if I was into girls (most lesbian problems)! I tried my hardest to throw out hints and clues but she never got it LOL!! Unfortunately I left that high school and we lost touch but found each other on Facebook and became friends again and we were both in bad relationships and lost touch again! But exactly one year later from the last time we talked I sent her a facebook message and we hung out and had our first kiss fireworks went off and I had butterflies! I always knew Bianca was ment to be in my life! We struggle everyday, all we have is each other but to US that's enough and I just want our day to be special because she deserves only the best!